(Nanowerk News) UCLA researchers have designed a laboratory test that uses microchip technology to predict how potentially hazardous nanomaterials could be. According to UCLA professor Huan Meng, certain engineered nanomaterials, such as non-purified carbon nanotubes that are used to strengthen commercial products, could have the potential to injure the lungs if inhaled during the manufacturing process. The new test he helped develop could be used to analyze the extent of the potential hazard. The same test could also be used to identify biological biomarkers that can help scientists and doctors detect cancer and infectious diseases. Currently, scientists identify those biomarkers using other tests; one of the most common is called enzyme-linked immunosorbent assay, or ELISA. But the new platform, which is called semiconductor electronic label-free assay, or SELFA, costs less and is faster and more accurate, according to research published in the journal Scientific Reports ("Semiconductor Electronic Label-Free Assay for Predictive Toxicology"). The study was led by Meng, a UCLA assistant adjunct professor of medicine, and Chi On Chui, a UCLA associate professor of electrical engineering and bioengineering. ELISA has been used by scientists for decades to analyze biological samples — for example, to detect whether epithelial cells in the lungs that have been exposed to nanomaterials are inflamed. But ELISA must be performed in a laboratory setting by skilled technicians, and a single test can cost roughly $700 and take five to seven days to process. In contrast, SELFA uses microchip technology to analyze samples. The test can take between 30 minutes and two hours and, according to the UCLA researchers, could cost just a few dollars per sample when high-volume production begins. 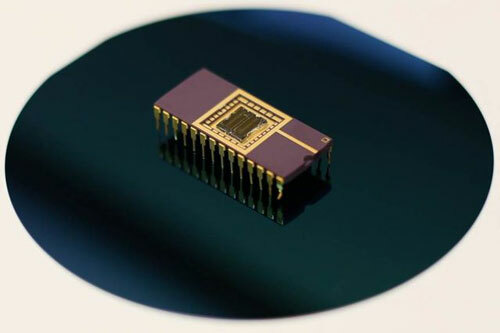 The SELFA chip contains a T-shaped nanowire that acts as an integrated sensor and amplifier. To analyze a sample, scientists place it on a sensor on the chip. The vertical part of the T-shaped nanowire converts the current from the molecule being analyzed, and the horizontal portion amplifies that signal to distinguish the molecule from others. The use of the T-shaped nanowires created in Chui’s lab is a new application of a UCLA patented invention that was developed by Chui and his colleagues. The device is the first time that “lab-on-a-chip” analysis has been tested in a scenario that mimics a real-life situation. The UCLA scientists exposed cultured lung cells to different nanomaterials and then compared their results using SELFA with results in a database of previous studies that used other testing methods.